The Joy Factory has a number of universal tablet mount solutions designed to help you make the most of your Apple iPads, Microsoft Surfaces, Samsung Galaxys, Google Nexuses, Amazon Fire, Asus Zenpads to name a few of the tablet types. 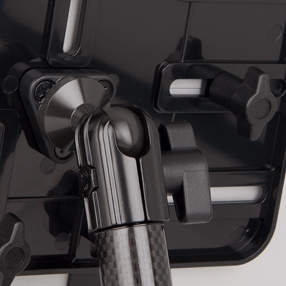 The Unite universal tablet mount family is made of carbon fiber, so they are lightweight and sturdy. They feature spherical joints so they can be adjusted almost infinitely. And since they fit all 7"-12" tablets they bring the best mounting experience to the widest variety of tablet makes and models. Quality craftsmanship equals dependable performance for the lifetime of this universal mount. The Unite M Universal mounts are designed with patent pending technology and precise engineering, making positioning a larger or thicker tablet quick and easy while ensuring the screen stays in the desired location. Flexible and ergonomic, The Joy Factory's Unite M solution provides strong support while offering a sleek, minimalistic design that complements the look of the technology. Like all The Joy Factory products, these user-friendly solutions are easy to install and maintain, meaning less time setting up and more time on the tablet. With options designed to cater to different configuration and portability needs, these simple solutions make it easy to incorporate tablets into workplaces, digital display areas and design applications. The Unite tray adjusts to the widest variety of tablets between 7"-12". Just slide in your tablet and turn the knobs on the back for sturdy connection every time. Unite mounts are built of high-quality carbon fiber arms. This superior material is lightweight and durable. The powerful combinations of carbon fiber with carefully designed joints produce mounts that are both easy to maneuver and sturdy to use. 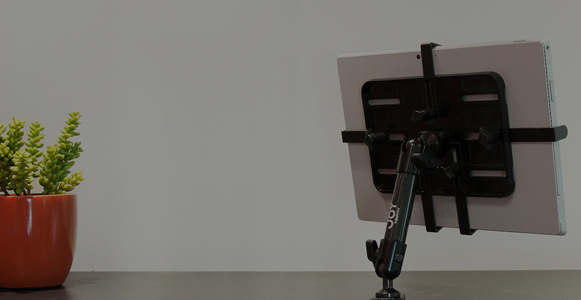 Unite mounts come equipped with two spherical joints for multi-angle positioning; one at the top of the mount where the tablet holder connects to the mount and one at the base. Each joint can rotate 360 degrees to easily position your tablet for optimum ergonomics thus reducing neck and back strain. Unite mounts that come with dual arms offer either a butterfly dial or a tightening lever to quickly position or reposition the mount to a more ergonomic preference. This additional feature on select mount types opens up a whole new dynamic to positioning.